Always ON Display Ads - Online Ads Do Not Get Thrown Away. Whatever your marketing budget may be, you will always benefit with "Always ON Advertisements" by Lamar J. Morgan. "Always ON" means online; working for you; twenty-four/seven. Advertise through collaboration with others and Lamar, and the cost of the advertisements is lowered to what your budget may be able to handle more effectively. Drawing attention to any advertisement does not have to mean annoying pop-ups, pop-unders or sliding into view ads. Hiding content that the viewer came to read, is more than annoying to many people and those types of "in your face" advertisements can make your customer move along to something else very quickly. When the content of the advertisement is what they came for, it is all that is needed. Stationary (no moving, jiggling or sliding), well written, short and to the point, keeps customers where they belong; reading the content you need them to absorb. Small businesses, joining together; collaborating on text and/or graphical advertisements form collaborative Clusters that work together to keep costs down and spread the word exponentially through social media. Three or four people spreading out across their own Social Media venues, help not only their own business, but the businesses of others in the collaborating Cluster. Social Media inclusion can be a part of your "Always ON" advertisement. You and your Collaborative Cluster could work out a schedule for spreading the word yourselves. However, you can also add to your deal with Lamar, some social media blasting with the ad you purchase. Let Lamar help you find businesses that will compliment yours. You don't need to be in competition with your Cluster Buddies so finding the right mix of business people is also a key to making this process work well, not only for you, but all the members of any Cluster group. 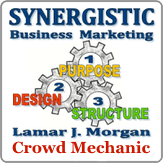 FIND OUT MORE --- Call or email Lamar J. Morgan at Synergistic Business Marketing to get more information on how to form a Cluster Buddy Group for advertising collaboration and "Always ON" advertisements.